For an oil-free, even and natural complexion, this is a perfect pick! The Lakme 9 To 5Flawless Matte Complexion is a compact that brings out your amazing skin tone and enhances your beauty. It is fortified with a unique Vitamin E formula to nourish your skin and give it a radiant look that lasts you all day. The compact is in a dazzling almond shade that blends into your complexion so well it can even be used as a concealer to hide your spots and freckles. This pack will fit into your make-up kit easily and it comes with a mirror and soft sponge to give you that ideal even-toned appearance. 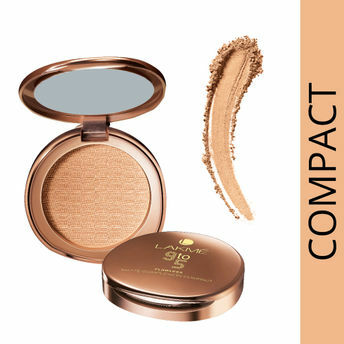 It has great features: like matte look throughout the day, Infused with Vitamin E and unique oil absorbing formula that nourishes and conditions the skin, Matte texture that gives you an even toned skin, Available in 3 unique shades, The in-built mirror and puff makes it ideal for working women. Explore the entire range of Compact available on Nykaa. Shop more Lakme products here.You can browse through the complete world of Lakme Compact .Alternatively, you can also find many more products from the Lakme 9 To 5 Flawless Matte Complexion Compact range.